In a large skillet over medium heat, cook ground beef, onion, green bell pepper and season with salt, about 7 to 10 minutes, until crumble and no longer pink. Add remaining ingredients expect cheese and green onions. Simmer 10 minutes. 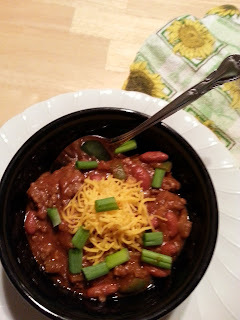 Christine, this is the kind of chili my hubby will EAT and have 2nds & 3rds! My "firey" additions (red pepper flakes, hot sauce, jalapenos, and tons of chili powder) are a bit much for him. I'll definitely try out your recipe on him, thanks! Thank you, Kim! Let me know what your hubby thinks about my recipe. Enjoy!